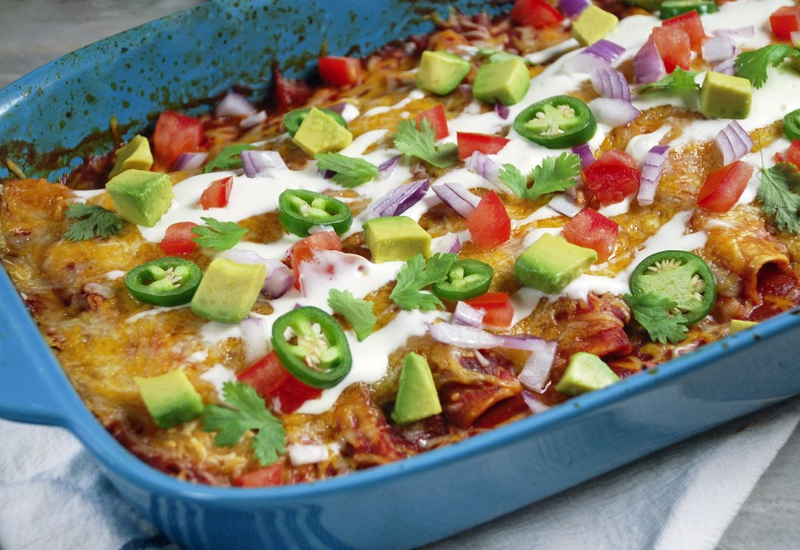 Enchiladas are Mexican comfort food at its finest. Shredded chicken and cheese are bathed in a fragrant homemade enchilada sauce, rolled in flour tortillas and baked until tender and melted in this crowd-pleasing recipe. This recipe is a great way to use up leftover chicken. Making your own enchilada sauce is simple but yields complex flavor: simmer an aromatic mixture of garlic, chipotle chiles, pureed tomatoes, cumin and oregano for a dish that's perfect for a weeknight meal, watching the big game, or a casual dinner party. Don't forget the toppings! Avocado, crema, cilantro, red onion and fresh tomatoes and jalapeños provide brightness and texture. For a sauce with less heat, split the chipotle peppers and remove the seeds before chopping. Try corn tortillas instead of flour for a gluten-free dish. To save time, use rotisserie chicken; discard the skin and shred the meat. If you're in a rush, use store-bought enchilada sauce. Per Serving: 885 calories; 45g fat; 69.9g carbohydrates; 63g protein; 168mg cholesterol; 5291mg sodium. I am obsessed with enchiladas, and this recipe turned out perfect! The chipotle peppers in adobo are one of my favorite ingredients to cook with. The sauce was delicious, not too spicy. I am so impressed how it turned out, using a simple can of tomato sauce. My husband ate half the batch by himself, he was so pleased with my cooking skills! Thanks, Mealthy! I really enjoyed these enchiladas. The sauce was delicious and very authentic tasting. I skipped the chicken and added beans for a vegetarian take, and it was amazing. It makes a good portion, but I end up eating half the batch myself! That's how good these are! Ignore the negative reviews, the only two on here are crying because the couldn’t use their “oh so precious pressure cooker” to make the dish. If you take your time and actually cook instead of, “throw it in the cooker,” you will be left with delicious and rather spicy enchiladas. This is defiantly a dish for intermediate chefs and could pose a challenge to beginner chefs and/or “appliance elitist cry babies”. Hope this review was helpful. Four stars.